This week we have 14 new comic books (with a magazine in the mix too) that feature a Spider-Man appearance. Not the least of which are 9 issues from the Avengers Vs. X-Men mini-series. While there are 5th printings of the #0-2 issues, in issue #7 of Avengers Vs. X-Men (out this week) Spidey manages to make a small cameo within the 6 variant versions of the book. It appears he may have a bigger role in upcoming issues. 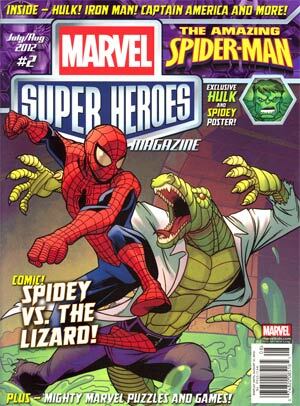 Also out this week is the 2nd issue of Marvel Super Heroes Magazine. It's a fun romp for younger readers. This actually was released in bookstores a week or two ago, but makes its way to comic shops now. And it still sports the newsstand barcode. I guess it wasn't economical to print 2 versions (newsstand vs. direct) for this one. They did the same thing with the first issue too. I saw the new Spider-Man movie this week, and it was...not bad. I was more spellbound by the first of the Tobey Maguire movies, but this one was solid too. Bottom line...Emma Stone rocks. Have a great week, and if you are headed to Comic Con in San Diego there should be some great boxdiving to be had. Enjoy!